Nutrition is a vital component in bodybuilding. Make sure you make the right food choices and get all the nutrition you need. The bodybuilding formula is train, eat and sleep. Resistance training in the gym helps you tear down muscle fibers so they can be rebuilt to make you stronger and make your muscles bigger. Sleep helps your muscles recover, so you can get back in the gym and start the muscle building process all over again. Eating the proper foods ties both these elements together. Conversely, eating the wrong foods will lead to fewer lean mass gains and greater gains in body fat. The best forms of dietary protein for bodybuilders come from lean cuts of meat. Beef products that contain less than 70 percent fat content such as sirloin tip, round steak, and top round are great choices for bodybuilders. These cuts have up to 49 grams of protein per serving, with less than 11 grams of fat (in varying amounts). The breast meat from chicken and turkey are also very good sources of lean protein. 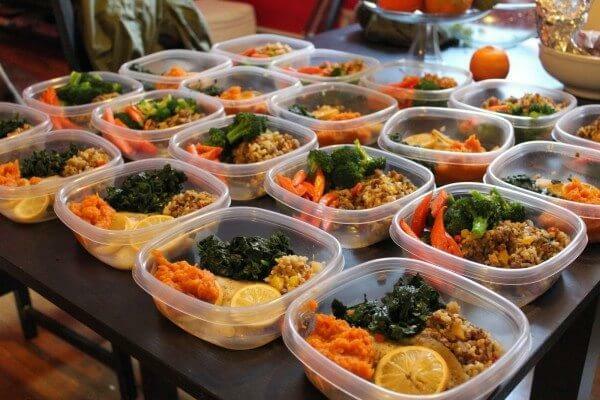 Good nutrition is the cornerstone of great bodybuilding. ​These cuts contain from around 24 – 27 grams of protein per serving with as little as 5 grams of fat per serving. The nutritional profile of fish is comparable to that of protein offering the same amount of protein and fat content per serving while also giving all the benefits that omega-3 fatty acids provide. Bodybuilders should avoid cuts of beef that are very high in fat. Although these cuts of beef are very high in protein, they are also very high in fat content which could lead to unwanted gains in body fat. Some examples of these high fat cuts of beef are rib-eye steak (which contains 30 grams of protein and 37 grams of fat per serving, and T-bone steak (which contains 33 grams of protein and 18 grams of fat per serving). Forms of poultry that should be avoided are dark meat and portions of chicken that include the skin. A chicken drumstick has 11 grams of fat per serving when eaten with the skin. This is double the fat that is present in a piece of breast meat. If you want to gain the most muscle and the least fat, stick to cuts of meat and poultry that have the lowest fat content. Carbohydrates are a necessary part of the bodybuilding diet. They provide the fuel that is needed to help you get through your workout routine. The best sources of carbohydrate come from low-glycemic foods like brown rice, sweet potatoes, whole grain bread and vegetables. Low-glycemic foods are slow digesting and high in fiber. These foods will provide you with sustainable energy that will not only help you get through your workout routine, but will also help you go through your daily activities with ease. Vegetables and fruits are other forms of carbohydrate that must be incorporated into a good bodybuilding diet. ​These foods are packed with lots of vitamins, minerals and fiber, which will go a long way to helping you digest all the protein you consume so you can build and maintain your lean mass. Your intake of high-glycemic carbohydrates should be limited. The only exception to this rule is after you’ve completed your workout. This is the only time when you want to consume high-glycemic carbohydrates because they will be used to help you build muscle and won’t be stored as fat. Examples of foods high on the glycemic index are white rice, white bread, breakfast cereals, cakes, pies, cookies, and candy. These foods provide few nutrients and tons of calories and should be avoided whenever possible. Essential fatty acids are needed to help with the production of testosterone, building cell membranes and support cardiovascular health. Flaxseed oil, coconut oil, and olive oil provide the body with some of the best sources of omega-3 and omega-6 fatty acids. Other sources of good dietary fat include avocados and nuts. Foods that are high in trans fat should be eliminated from the bodybuilding diet. These types of fat increase the risk for heart disease and elevate blood cholesterol levels. ​Some examples of foods high in trans fats are foods fried in oil, pre-packaged foods (potato chips, crackers, and popcorn), and foods that are baked commercially (donuts, pastries, cookies). Butter, margarine, whole fat cream and milk also contain high amounts of fat and should be avoided. Everyone has cravings and may eat foods that are not good for them, and bodybuilders are no exception. Eating fast food or junk food once a month or once every few months will not harm you, but if it’s part of your everyday eating habit you need to make some changes. Lean cuts of meat, low-glycemic carbohydrates and essential fatty acids that contain omega-3 are the best foods to consume and should form the major part of your diet. Train, sleep, and eat is a formula that will only produce the greatest amount of gains in muscle size and muscle strength if you eat the right foods.